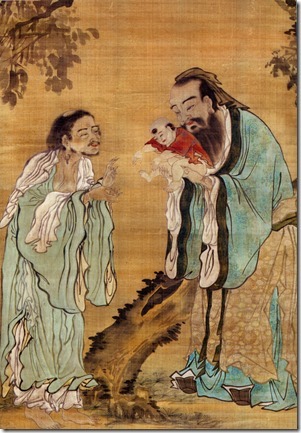 Other canonical Chinese philosophers range from Mencius, who expanded on Confucius’ teachings, to the Hobbesian Han Feizi of the Legalist tradition, to the metaphysical Zhuangzi. Perceptions of this canon changed through Chinese history. Novels were traditionally viewed with disdain, and deemed unworthy of serious study, but they were beloved by the general public, who often passed them on orally. From the time of the Tang Dynasty, scholars wrote commentaries on Sima Qian’s Records. 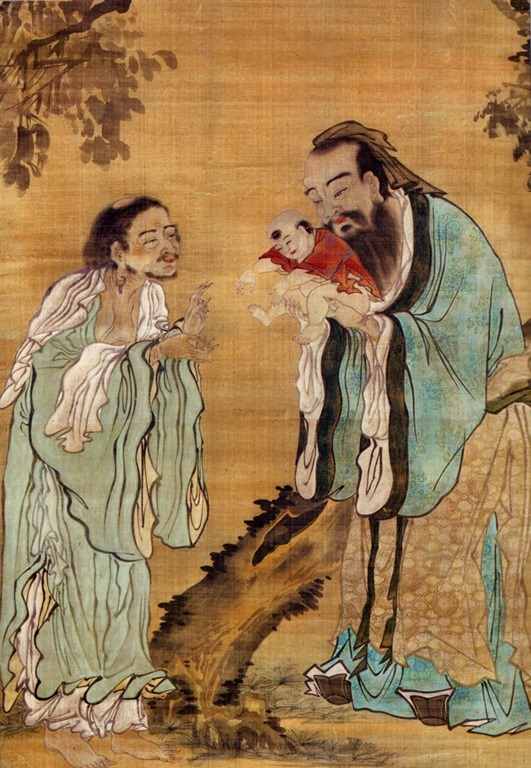 Most of all, the Confucian texts were placed at the center of an education, as ambitious Chinese boys had to write essays on them in the all-important civil service examinations, and Confucian philosophy spread through the masses orally. The fall of the last dynasty in the Xinhai Revolution of 1911 and the New Culture Movement after changed all that, though. The Chinese canon fell into disfavor, as it was associated with the “weak and backward past” that had left China at the mercy of Western powers. The Communist takeover in 1949 saw this canon excised from public life. The tales of cavorting maidens were deemed decadent, the accounts of emperors were deemed counterrevolutionary, and Confucius was deemed the philosopher of reactionary feudalism. No longer were these things taught in schools or reenacted on the stage (although many parents continued to teach them to their children in private). Instead, Mao Zedong substituted his Little Red Book and revolutionary works like Taking Tiger Mountain by Strategy, along with the philosophy of Marx and Lenin. This came to a head with the Cultural Revolution (1966-76), when Red Guards declared war on “old ideas,” burned books en masse— many of them Chinese classics— and even desecrated Confucius’ tomb. Whilst the canon continued to be taught in schools in Taiwan and Hong Kong, for many years it seemed to vanish from the land of its birth. The irony was that Mao himself had a great appreciation for the canon. Former U.S. Secretary of State Henry Kissinger, who visited Mao in Beijing in 1972, described the chairman’s study thus: “Manuscripts lined bookshelves along every wall; books covered the table and the floor; it looked more like the retreat of a scholar than the audience room of the all-powerful leader of the world’s most populous nation.” Mao’s collection included classical Chinese poetry, The Water Margin, and even Dream of the Red Chamber, which he boasted of having read five times. What he enjoyed privately, he denied to everyone else. Why this renewed enthusiasm for the canon? Many point to the enormous changes in Chinese society since Deng Xiaoping began opening and reforming the country in 1978. As fortunes rose with the embrace of capitalism, commitment to Communist values dwindled, such that few Chinese today take them seriously. Chinese policymakers worry about a populace driven only by materialism and without a moral compass. The absence of any genuine loyalty to Chinese Communism also leaves many people without a strong sense of national identity. Restoring the canon, therefore, also serves a unifying function, explains Bryan Van Norden, head of philosophy at Yale-NUS College, and author of Taking Back Philosophy: A Multicultural Manifesto. “Xi is trying to reintroduce the traditional canon…to give people a group identity as ‘Chinese,’” he says. It’s a logical decision, and Chinese should certainly cheer the return of their canon to its proper place, but this move presents risks of its own for the CCP. The Party, after all, is the definitive authority on Chinese Communist doctrine, but the same cannot be said of Chinese canonical works, which can be interpreted in different ways by different people. A parallel here is the Reformation. For centuries, the Pope, seen as God’s representative on Earth, was the ultimate authority on Christianity, and salvation could only be obtained through the priests and churches he sanctioned. When Martin Luther began preaching that the last word on Christianity was not the Pope, but the Bible, which could be read and interpreted by anyone, he caused a revolt against the Vatican and a schism within the faith. Similarly, if the source of values in China is no longer the CCP, but the Chinese canon, which anyone can read and interpret for himself, what might this mean for the Party’s authority? And how might Chinese people interpret these canonical works? Will they see the revolutionary CCP as the virtuous rebels in The Water Margin, or more like the corrupt and unjust Song Dynasty they resisted? Will they see Xi Jinping as one of the benevolent emperors in Sima Qian’s histories, or more like the tyrant Qin Shi Huang? Will they see him as the kind of worthy ruler Confucius counseled serving, or an unworthy one who should be shunned? Perhaps that’s what Chinese authorities feared when in 2011 they surreptitiously removed the 31-foot statue of Confucius from near Tiananmen Square – just four months after they had unveiled it there. A loose canon like China’s is an uncertain tool for social control. Shaun Tan is a writer based in Hong Kong. His writing has appeared in Quartz, The Diplomat, and the Malay Mail Online. He enjoys reading, playing tennis, and talking about himself in the third-person. A totally non-exhaustive list of Chinese canonical works is provided below.